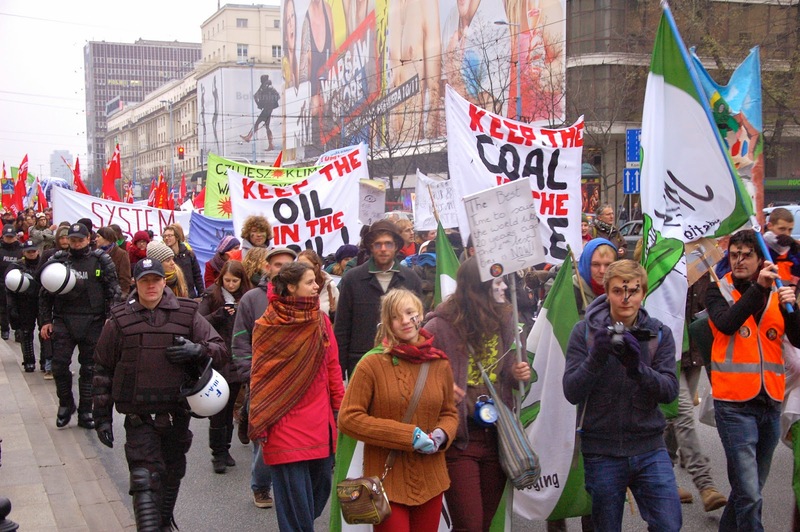 Climate rally in Poland last year during the climate summit Cop 19. Photo credit Jamie Henn/350.org. Just days before the UN Secretary General Ban Ki-moon hosts a summit on combatting climate change on the 23rd of September, environmentalists from across the globe are coming together to pressure governments to take action on climate change. The climate group 350.org says that over 2,700 events in 150 countries have been planned with a rally in New York set to be the largest with the attendance estimated to be 100,000. In London speakers will include Actress Emma Thompson and the Bishop of London. Environment organisations, faith and grassroots groups will join forces to create a ‘People’s Climate March’, starting with a peal of church bells across the city and culminating in a rally at Parliament. A ‘Fossil Free Bloc’ at the march will be chasing giant ‘carbon bubbles’ through the streets demanding divestment from fossil fuels and the end of the industry’s interference in politics. But in the UK, the action is not only happening London, 22 other events have been planned around the country. In Tanzania, the Maasai plan to march calling for action from their ancient homelands in the Serengeti, while in rural Papua New Guinea, students from a primary school will march to a nearby lighthouse which has recently become semi-submerged due to rising sea levels. In Africa’s largest city Lagos, Nigeria plans are underway for an historic climate march through the streets. Throughout Nigeria solidarity events will take place in rural areas. In Colombia a crowd of 10,000 people are expected to march through the capital Bogota. In Australia after the climate march convenes in Melbourne, a group will walk 700km along Australia’s eastern seaboard to the capital Canberra. Arriving at the Parliament they will raise awareness about climate impacts. Back in Europe, Berliners will form a silent parade, a stream of cyclists and march for children, all convening at Berlin’s iconic Brandenburg Gate. Paris, which are the hosts for next year’s defining Cop 21 climate summit, in which world leaders have agreed a climate deal must be reached, are planning similar activities as parades, marches and bicycle rides will take place on bridges across the river Seine. In Amsterdam divestment activists from Fossil Free NL will visit the pension fund ABP and ask employees if they want their employer to divest from fossil fuels. Back in North America and a historic joint event between Seattle in the US and Vancouver in Canada: an international rally will take place where thousands will link hands across the border to demonstrate that climate change knows no borders. US actor Edward Norton and Argentinian football superstar Lionel Messi, have also shown support for the march.